If you want to remodel a bathroom in your McKinney, Texas, home, allow the reliable professionals at Star Home Remodeling to assist you. Since 2007, we have been customizing homes to better meet the needs of our clients, so you can feel confident that we have the experience required to provide you with the top-notch bathroom remodeling services you’re searching for. Additionally, our work has earned us a number of accolades throughout our many years in business, such as multiple Best of Houzz awards. What’s more, you can expect our team to provide you with all the information you need to make the best decisions for your bathroom remodeling project. We want you to understand the different benefits of all the products and services we offer so that you can feel confident you are making the perfect choices. 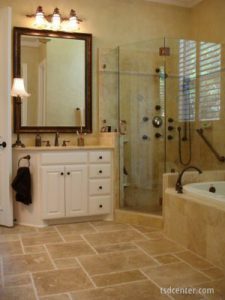 To learn more about the bathroom remodeling services we offer to homeowners in and around the McKinney, TX, area, contact Star Home Remodeling today. We’ll be happy to answer any questions you have and arrange for a consultation at our showroom or your home.